Telescoping flagpoles are operated by pushing a button to raise and lower the flag. No ropes or pulleys are needed. They are also lightweight and collapse down to a manageable size, making them easy to relocate. Because they have several moving parts and are constantly exposed to the elements, however, buttons may stick, springs may jam and the operation may becoming stiff and difficult. Most of the problems are easily remedied by simply cleaning and lubricating the parts. Raise the flagpole without the flag attached and hose it off with water. Add 1 tbsp. of liquid detergent to a bucket of cold water. Lay the flagpole on its side and rub it with a rag dipped in the soapy solution. Dirt and grime buildup is a common reason for the telescoping mechanisms to stick and be difficult to operate. Pay special attention to dirt that may have collected at the collars of the individual sections of the pole. Rinse off the soap with the hose, and allow the pole to dry. Use a rag to rub light lubricating oil over all moving parts of the flagpole to remedy sticking and jamming. Pay special attention to the locking buttons on the individual sections of the telescope, which are especially prone to sticking. Look for rust and, if found, scrub it off with steel wool dipped in water. 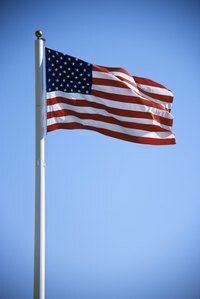 The steel springs that operate locking mechanisms on some flagpoles are prone to rust. If the rust cannot be removed by scrubbing them with steel wool, you will need to purchase new springs. Search the flagpole for any broken or cracked parts. If any are found, many companies exist that sell replacement parts either individually or in an assembly repair kit. Remove the old part with a screwdriver or wrench and bring it to a hardware store, or peruse online companies to obtain an exact replacement.